We all need a muse. I was looking for a muse. "Staying open" and "not becoming jaded" in our world can be quite a challenge (especially in the design world). I found my muse: Israel. Israel is exquisitely inspiring, bursting with creativity, a mixing of the old with the new; a true blending of European modern, American elegance and comfort. Here, cutting edge technology meets with antiquity. 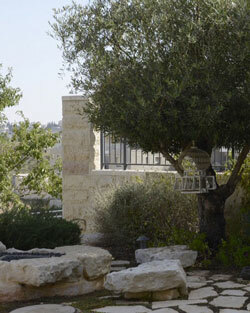 The spiritual connection to designing and creating in Israel is truly intoxicating, like an expression of prayer. In this new chapter of my life, I plan on offering a Concierge Design Service to Americans planning on either moving to or buying second homes in Israel. What is a "Concierge Design Service?" I will be commuting between my two home offices and partnering with talented trades in both lands. My life dream to own a home in Israel and work there has become a reality. I am now able to serve both the American and Israeli communities, bridging the two worlds. By offering a "Concierge Design Service" I will be able to design and navigate an otherwise daunting undertaking. I plan on assisting in team building, design, selections, construction management, and seeing the project through to the final detail. I can make it fun, less stressful, practical and beautiful. One of my husband's requests for our home was to make it so beautiful and special that it kept pulling our hearts back, to make us long for it. I would like to help others feel the same. Why do I need a Concierge Design Service? As I like to say, "To deal with shenanigans!" As a non-Israeli, or new Israeli citizen, soon to buy and build a home in Israel, it is even more difficult. Fraught with unexpected situations, even simple things become complicated, and I call them "shenanigans." Having lived through the process as an American, (even for a seasoned veteran) it was at best challenging. I am intimately acquainted with American standards and expectations, have figured out how to deal with Middle Eastern cultural norms, and have become very familiar with Israeli construction (very different from American methods). By coming and going to Israel we (the client and myself) will be able to continue designing and working on the project on either side of the Atlantic. In addition to finding out what you would like or need in a home, I will try to find out what delights you. In our home we very much wanted outdoor space, so we found a fabulous garden apartment. We designed the landscape in a way that almost feels biblical, and it immediately became the family's favorite hangout spot. What delights us? The old olive trees and fire pit!